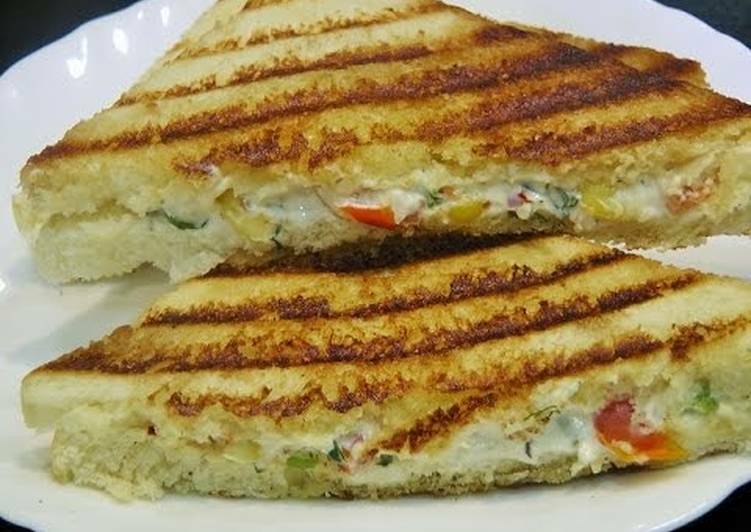 Here are some easy bread sandwich recipes which can be done in minutes. These are easy, quick and healthy. Kids will definitely love these varieties. If you don’t have grill or sandwich maker then toast bread in a pan and then add the stuff in between 2 bread pieces. Smash 1 full ripen avocado into a bowl. Add finely chopped onions and tomatoes to this mixture. Add salt, pepper & lemon juice as per the taste. Mix everything and spread it on a toasted bread. Serve as a breakfast or evening snack. Beat eggs into a bowl, add tomatoes, onions, spinach into this mixture. Add salt and pepper according to test. Heat a pan and pour this mixture. Wait until egg turns omelet or becomes solid. Put this on a toasted/grilled bread to eat like a sandwich. You can add extra veggies. In a mixing bowl take the thick curd (Make sure there is no water in the curd). Add all the chopped vegetables. Add salt & pepper as per the taste. Mix everything, spread it on a bread slice. Cover with another bread slice and trim off the edges. Spread butter on a grill, toast the bread until it turns golden brown. Add boiled corn, capsicum, spinach & cheese into a bowl. Add salt & pepper according to taste. Spread butter evenly on 2 bread slices. Add corn & capsicum mixture in between. Grill for 5 minutes in a preheated sandwich maker. Remove once they turn golden brown. Crumble/chop paneer (Roughly) into a bowl. Add curd, salt, and pepper as per the taste. You can add extra spices(turmeric, jeera powder, chat masala, chili powder) to enhance the taste. Mix everything and spread it on bread. Add onions, tomato & Capsicum on top of mixture and grill until bread turns golden brown. Smash avocado smoothly into a bowl. scramble eggs with salt and pepper. Mix everything, spread this mixture on a toasted/grilled bread.